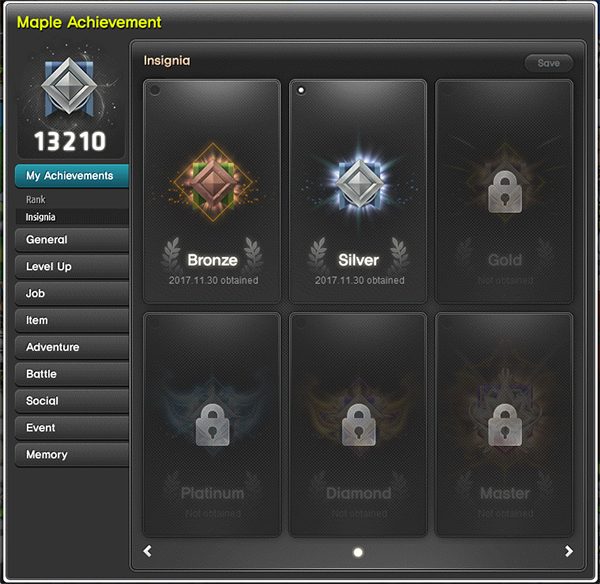 Feel Accomplished with Maple Achievements! | Dexless, Maplestory Guides and More! 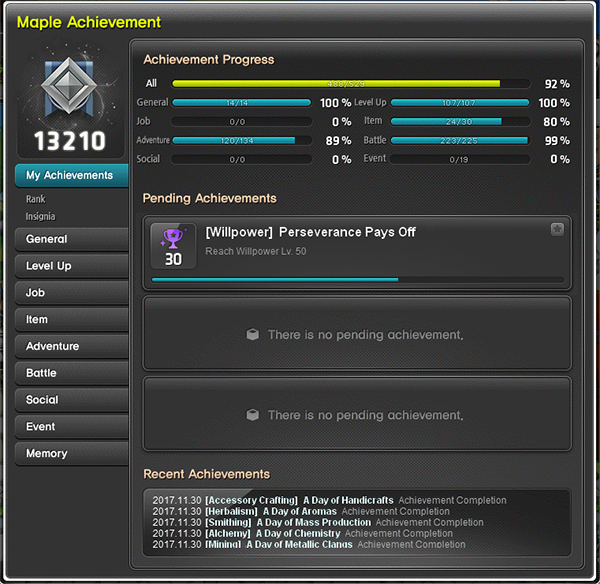 Feel Accomplished with Maple Achievements! 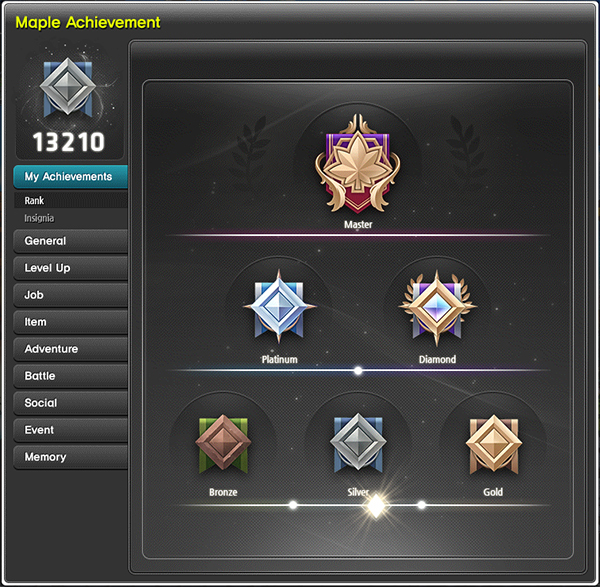 Keep track of your success with brand-new Maple Achievements! Characters Lv. 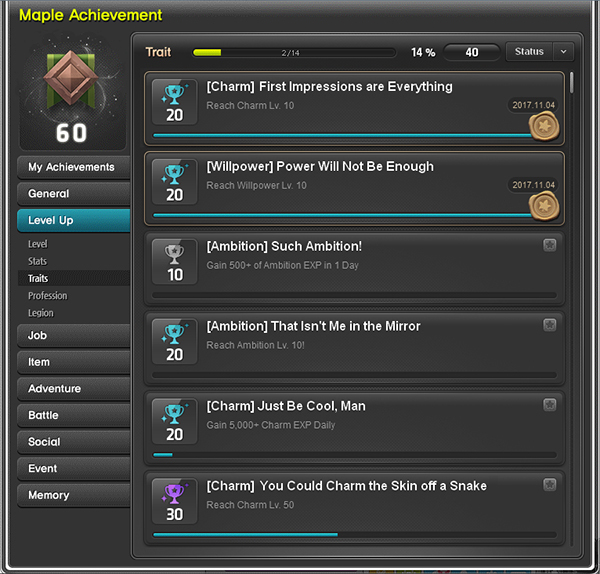 33 and above can start tracking their adventuring accomplishments by completing the quest ‘Begin Maple Achievements’ from the quest notifier on the left-side of the screen. You can open the achievement UI by clicking the ‘Menu’ button at the bottom of the screen and selecting ‘Maple Achievement’. Your achievements are shared across all characters on the account, regardless of world. There are several different categories to help you organize your success. General: Feed your pet, obtain daily gifts, complete Masterpiece Fusion goals, and more. Level Up: Work on your leveling, grow your traits, succeed in professions, and more. Job: Make your job advancements, complete story quests, perfect your skills, and more. Item: Collect specific items, equip certain items, and more. Adventure: Explore Maple World, complete daily quests and party quests, clear Dream Defender, and more. Battle: Earn Combos, defeat specific bosses, obtain special items, and more. Social: Play in a party, join a guild, trade with other players, and more. Event: Complete specific event-related achievements. Memory: If an achievement can no longer be completed, it will appear here. When you have a specific achievement in your sights, you can get more information about it by clicking the ‘+’ icon on the achievement. This shows you exactly what you need to do to complete it, and displays your progress. You can also click the star icon on the achievement to add it to your notifier, where it appears as you play. Some achievements give you rewards when you complete them! You can claim your reward by clicking the green gift box icon on the achievement UI. Each achievement is worth a certain number of Achievement Points. Achievements worth more points are more difficult! You can mouse over the points assigned to an achievement, and see how many other players have completed it. You can track your rank from the ‘My Achievements - Rank’ category in the achievement UI. Reaching different ranks or completing special achievements lets you earn Insignias. You can view your Insignias from the ‘My Achievements – Insignia’ category in the achievement UI. 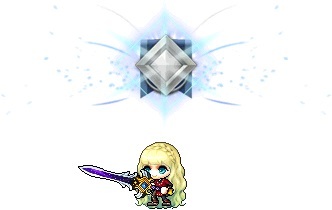 You can select an Insignia to use, and it will give you a skill with a unique visual effect! Insignia skills are located in your skill book in the basic skills tab.